Improve the beauty, resiliency, and value of your home with Flooring America of Chandler. We are your dependable destination for luxury vinyl flooring in Chandler, AZ. With our wide-ranging product selection, personalized customer service, and professional installation solutions, attaining picture-perfect spaces is a hassle-free experience. It’s your property. Floor it how you like. Our showroom features samples of luxury vinyl tile and plank flooring from the leading brands. Here, you may browse our catalog, view samples of our flooring, and order your favorites. Best of all, our friendly and knowledgeable showroom associates will work with you to find the right materials that will meet your needs. Whether you are planning to re-floor a single room or your entire property, we’re here to make your project a success. Durability: LVT and LVP are made with composite materials, giving it a sturdy composition that stands up well against daily wear and tear. It holds up against foot traffic, bumps, scrapes, impacts, and scratches. This makes luxury vinyl a smart choice for active spaces, like the kitchen and bathroom. 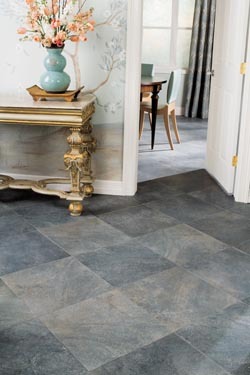 Ease of Maintenance: Luxury vinyl flooring is a solid surface flooring. Water, dirt, and dust have a hard time causing stains on this material, which makes it easy to clean and maintain. With luxury vinyl, you will spend less time and energy cleaning up: a perfect characteristic to consider if you have children or pets. Design Flexibility: Luxury vinyl is available in many different colors, patterns, and designs. It also successfully mimics the appearance and texture of materials like solid hardwood and ceramic. Materials like luxury vinyl plank flooring provide the flexibility to impart natural beauty in rooms like the basement or bathroom while keeping project costs sensible. The strength and beauty of your new flooring depend on a successful installation. Let our experienced team do all of the hard work for you. Our showroom facilitates luxury vinyl tile and plank installation. Our trained and experienced installers complete re-flooring projects of virtually any size and scope. We also remove the old flooring from your project space and utilize the right equipment and methods when placing your new flooring. When we are done, you will transform your space. Contact us to learn more about our luxury vinyl flooring options. We serve homeowners and business owners throughout Chandler, AZ, including Phoenix, Tempe, Gilbert, Ahwatukee, and the surrounding areas.